Even if the music wasn't awesome I would be tempted to post this album because of the title alone. So good. Anyways I don't often compare bands favorably to Everclear (I tend not to think about Everclear that much, actually) but I think it fits here. 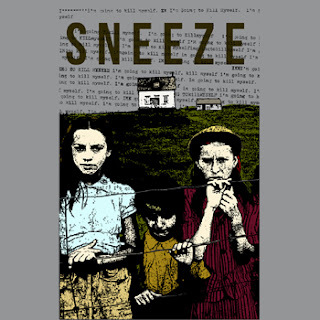 I saw Sneeze play a crappy little venue in Fresno last summer and they basically have perfectly crunchy guitar tone that reminds me immediately of the Blue Album or Pinkerton. Nothing too complicated here it's mostly just really solid songwriting and really catchy chord progressions. The singing is pretty good and you can tell that the band knows how to write good pop songs while also adding some punk sneer for good measure. Did I mention the crunchy guitar? I think I did. Fifteen songs in thirty minutes = awesome summer jams. I recommend listening to this in a car with a horrible stereo system.